JenJen is into a lot of exciting and exotic activities, wingsuiting among them. She got into wingsuiting through BASE jumping, as wingsuits are wonderful for getting you away from the object and extending the jump! Through December 2006, while at the University of Texas at Houston, MD Anderson Cancer Center, she often jumped with the Texas birds at Waller or Spaceland. 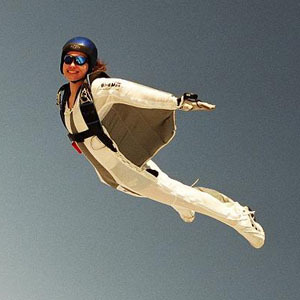 At Skyfest 2007, she participated in the Texas State Record Flock of 22 wingsuiters. Currently, though, she is doing post-doctoral research at the Norwegian Centre for Stem Cell Research (NCS), at the University of Oslo, Norway (where there are LOTS of places to practice her wingsuit BASE skills!) so we don't see much of her in Texas these days except for occasional visits. To learn more about JenJen, check out her personal website!